Modern-day program example of Feds' efficiency—but to what end? Possibly the only cultural phenomenon that had a bigger year in 2010 than Justin Bieber was the needs-based entitlement program formerly known as Food Stamps. Now dubbed the Supplemental Nutrition Assistance Program, or SNAP, it enrolled more than 40 million people for the first time in March 2010. By August, that number had grown to 41,836,300, at which point nearly one in seven Americans was receiving monthly payments of approximately $133. "Nothing tells the reality of this economy better than this," Bloomberg Television news anchor Margaret Brennan uttered solemnly in January 2010, setting the tone for a year's worth of media coverage. In May, the Atlanta Journal-Constitution told the tale of an entertainment attorney who'd once earned $250,000 a year resorting to food stamps to feed his two kids. In June, NPR featured the story of a former restaurant critic who was now dining on Uncle Sam's dime. Even Newt Gingrich bought into SNAP's rapidly expanding girth as a telling metric of economic stagnation. "Which future do I want?" he wrote in an October memo sent to Republican candidates. "More food stamps? Or more paychecks?" But the Great Recession isn't the whole story behind food stamps' second great awakening. The Department of Agriculture's Food and Nutrition Service (FNS) has been engaged in a lengthy campaign to boost the program's enrollment rates. In 2000, just 16.9 million people were receiving food stamps, and only 50 percent of those who were eligible even participated in the program. Then FNS and the state agencies that administer SNAP began streamlining application processes and ramping up their outreach efforts. By 2007, 66 percent of "eligibles" had been converted into participants, and preliminary data suggests that that percentage continued to increase in 2008 and 2009. The growth of SNAP was driven partly by the transition from paper-based coupons to electronic benefit transfer cards, a process that was mostly completed by 2004. Convenient, stigma-free purchasing power such as this is just one the way government has been, in the words of Secretary of Agriculture Tom Vilsack, "breaking down barriers to participation" in SNAP. 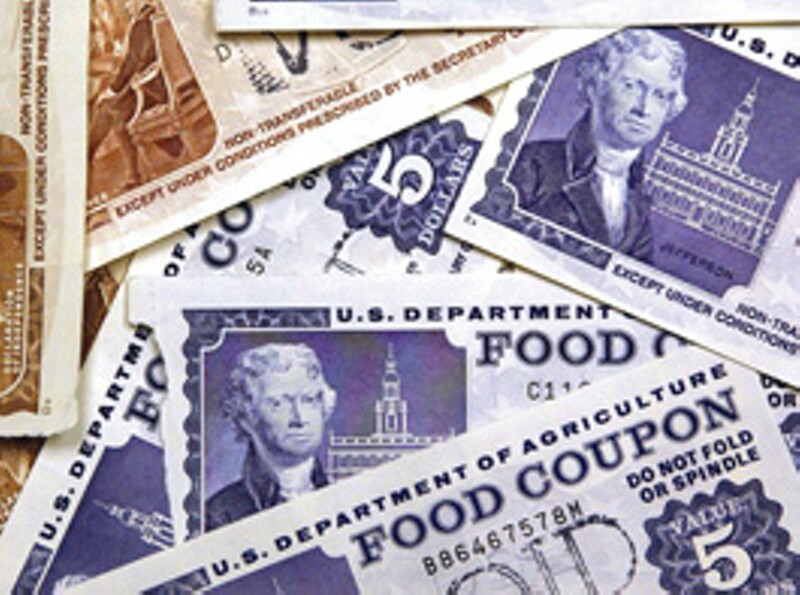 In theory, one cannot receive food stamps with a gross monthly income exceeding 130 percent of the poverty level, and a participant is ineligible who has "countable resources" such as bank accounts or vehicles that fail to qualify for certain exclusionary criteria. But while the federal government sets these standards, it also gives states leeway for modification. Under a process known as "broad-based categorical eligibility," SNAP applicants in dozens of states are now automatically considered eligible if they're already participating in the Temporary Assistance for Needy Families program. Details vary, but categorical eligibility typically means applicants can have gross incomes of up to 200 percent of the poverty level, aren't subject to asset tests and don't need to verify their net incomes. The FNS and state agencies have also implemented ways to increase monthly payments. Ultimately, a household's net income determines the size of its payment. But recipients can claim various deductions, including one for utilities allowed to be as much as $273 a month. According to federal guidelines, recipients can claim the maximum utility deduction regardless of how much they actually spend on utilities as long as they participate in the Low Income Home Energy Assistance Program. But while the government believes SNAP can bulk up the economy, it also believes the program can slenderize the body politic. In 2009, FNS chief Kevin Concannon suggested the agency's goal is to overhaul America's diet. "The analogy I think of is in the anti-smoking arena," he told the Washington Post. "It took a number of years to really get the systems reoriented and established so that we prohibit smoking in public places." As the largest of FNS' 15 nutrition assistance programs, SNAP is also the most strategic one to reorient. Will Humble, director of Arizona's Department of Health Services, envisions using SNAP to compel food retailers to carry more nutritious products. "Why is SNAP a good leverage point for changing vendor behavior?" he asks. "Because the federal government provides more than $50 [billion] in SNAP benefits every year." The FNS aims to use this leverage on purchasers as well as vendors. With its electronic benefit transfer system, it can now intimately monitor and potentially influence the eating habits of more than 40 million Americans. New York City mayor Michael Bloomberg has already floated the idea of making soda off-limits for SNAP recipients. And in December 2011, the FNS will start testing a "healthy incentives" program, in which participants receive a 30 percent discount on their electronic benefit transfer purchases of fruits and vegetables. As coercion goes, this may qualify as pretty benign stuff. You give millions of hungry Americans money for food. And then you give them even more money if they agree to eat like upscale locavores battling big corn syrup. But locavores want to decentralize the food system in an effort to reclaim control over what goes into their bodies; SNAP is moving in the opposite direction. And as its new status as a behavior modification tool grows increasingly apparent, so too does the realization that the program's growth, commonly attributed to economic desperation, is fueled at least as much by policy imperatives. Food stamp use has hit historic highs because the government's efforts to expand the program have hit historic highs. Even more than McDonald's, the Feds have mastered the art of supersizing.